Bow hunting impala with Mkulu African Hunting Safaris. Bow hunting impala can be likened to bow hunting white tail deer. The one is to South Africa what the other is to NA. They are one of the cheapest animals to hunt and there are plenty of them. 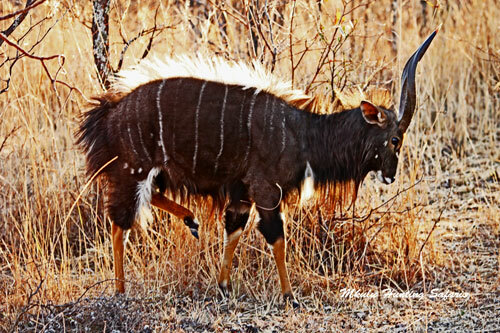 Anyone who starts bow hunting in South Africa will either bow hunt impala, or warthog. Impala are one of the Top 10 most desired antelope species to bow hunt when it comes to international hunters visiting South Africa on a bow hunting safari. During the rut (end April and May) impala are vocal in their calls that consist of a lot of blowing and gurgling. used. Impala are slightly smaller than white tail deer. A factor bow hunters wishing to bow hunt impala must remember is the severe amount of string jumping these beautiful animals do when shot at. Allow at least 6” down from point of impact to point of aim. Review our impala bow hunting video in slow motion to see how much they jump the string. Below are a number of suggestions with regards to draw weight, shot placement and tips for bow hunting impala in South Africa. Good luck on your bow hunting impala bow hunt. The impala bow hunting prices 2018 South Africa have been confirmed at $ 475 for the duration of the 2018 South African impala bow hunting season. The recommended draw weight for bow hunting impala in South Africa is any increment greater than minimum draw mass. Any draw weight equal to or greater than 55 lb is recommended for bow hunting impala. The minimum kinetic energy (KE) required for bow hunting impala is 50 ft / lb. A minimum arrow velocity of 245 fps is suggested for bow hunting impala in South Africa. A minimum arrow weight of 380 grains (gr) is suggested for bow hunting impala in Africa. 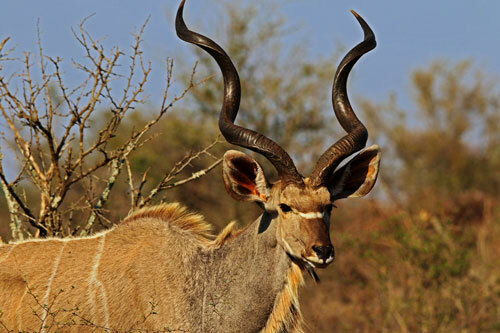 Average shooting distance when bow hunting impala in South Africa from our bow hunting blinds are seldom further away than 19 to 25 yards from your trophy impala. You decide which brand broad head you would like to use when bow hunting impala. Impala have a rather small area covering the vital organs for adequate shot placement. 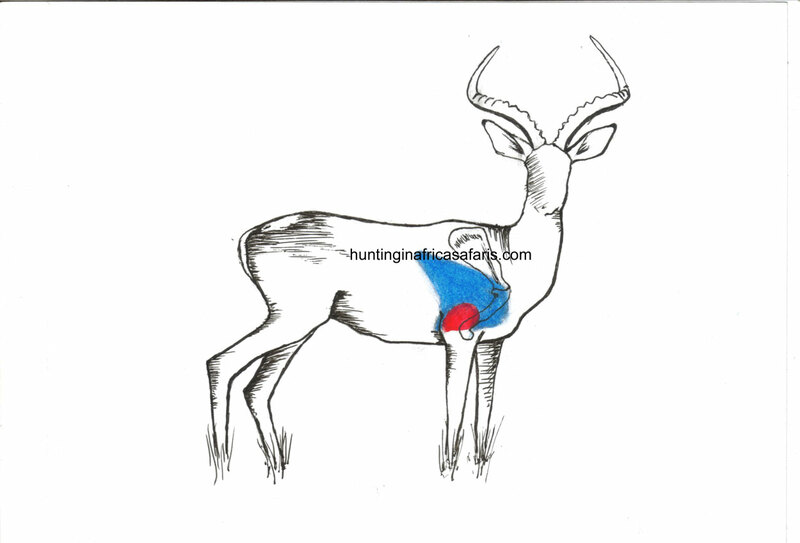 Place the shot right behind the shoulder of the impala in line with the front leg, one third of the way up from the bottom of the chest to the top of the back. The dark brown area along the flanks will be a good indication of the height where the arrow should be placed. Impala are extremely prone to jumping the string. Caution must be taken to aim at least 4″ lower than the intended point of aim. Below is one of our impala bow hunting videos. Take note of the impala jumping the string and how much lower you have to aim to hit the vitals. 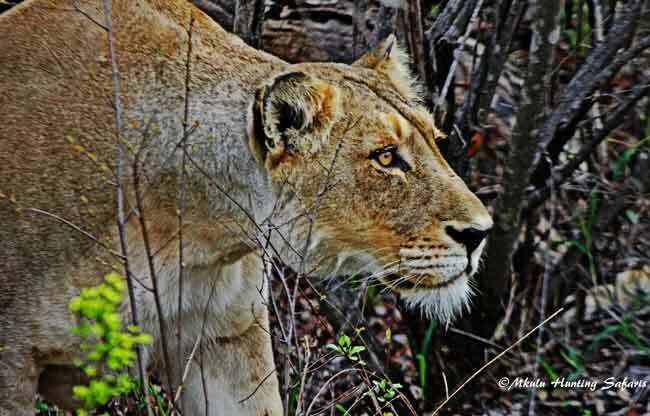 For more bow hunting videos please visit our African hunting videos section. The following tips for bow hunting impala are done from the perspective of still hunting from a blind. Impala come to water cautiously and are weary the whole time until they start drinking. Impala females will often stand some distance away from the water and approach a few steps at a time with the young ones rushing in to be at the water first. The mature males will mostly be at the back of the herd making sure all is well before committing to the drinking trough. During the impala rut the males are vocal and busy retaining their harems or fighting for mating rights. 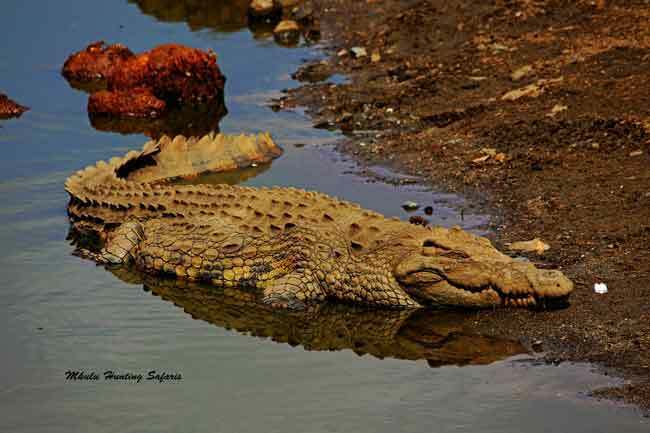 This makes them run up and down vocalizing and fending off possible intruders. When the herd leaves the dominant male will remember why they were at the water in the first place and return for a quick drink. 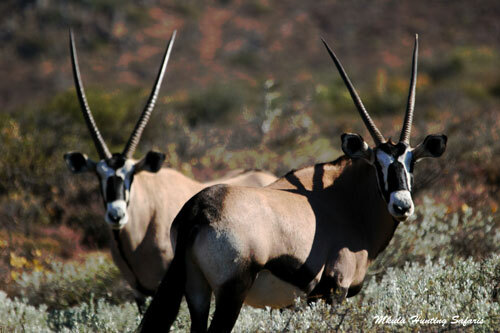 Click on the images below to view the gallery of impala pictures. 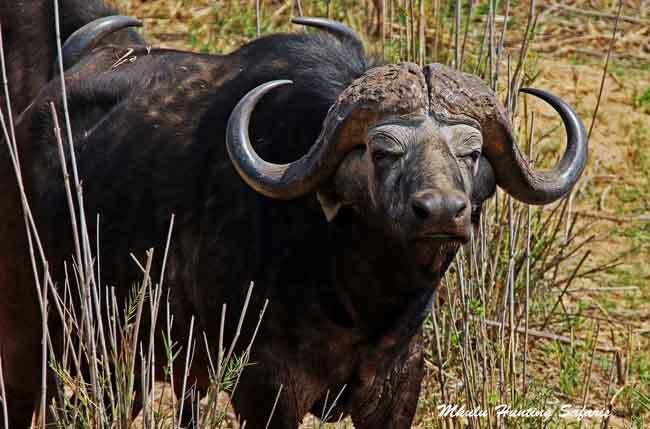 The impala rut starts roughly after the fourth week of April (can differ slightly according to different regions and from year-to-year) and lasts until about June. During or after September the rams (males) form bachelor herds and even may become solitary. We suggest the best time of year for bow hunting impala in South Africa would be between May and October lasting from the start of the impala rut to almost the end of the dry season. We can and do bow hunt impala from January to December.